I had only recently started a job for Derbyshire County Council when I was diagnosed with Secondary Breast Cancer in my spine and hip. This incurable but treatable cancer is life-limiting both in terms of what you can do and how long you live (average 3 years). This was devastating news and I was in a lot of pain in my back. I could no longer do any of the exercise I enjoyed. I felt too tired and in pain to continue my work too. Two years later my treatment is working, my tumours are stable and although I still can’t do anything high impact, I feel much better. I double checked with my consultant who said I could return to cycling as long as I knew the risks (potential paralysis if I fall off due to my weak back). This coincided with me starting on the Macmillan Active Everyday exercise programme and seeing a poster at Weston Park Hospital for Challenge Cancer Through Adventure. Then the adventure started! Before my secondary diagnosis, my husband and I had planned to go on a cycle holiday in the Loire Valley. Those plans were put on hold until Challenge Cancer Through Adventure came into my life. The challenge involved us cycling roughly 20-25 miles every day for 7 days with an extra two days cycling to get to the start of the organised tour. I had done no exercise for 2 years and the furthest I’d ever cycled was 15 miles. With the challenge booked, I was motivated to get fit – fitter than I had ever been! I had to be able to do the cycling as our hotels were booked along the route and our luggage was travelling to them. In preparation for the challenge, my whole attitude changed from thinking I could no longer do things to thinking I am going to get fit and I can do stuff. As it got nearer to the start of the challenge, I got more and more worried about whether I’d be able to do the cycling. I’d been going on practice rides and finding my back started hurting after about 10 miles. I thought I wasn’t going to enjoy this. It wasn’t just the pain that upset me; it was what it represents too. I was less worried about my fitness – after all, we are only going on flat roads along a river, I thought. I was really looking forward to going on holiday though. The day before we set off, I checked the weather forecast. The Loire Valley was in the midst of a heatwave with temperatures soaring up to 40 degrees for the first two days of our trip. I thought that there was no way I would be able to cycle in that heat so I cancelled the cycle hire to get to the start location of the tour and we took a train, and hitchhiked instead! We flew to Paris from Doncaster airport. No exaggeration, it took 4 minutes from being dropped off at the airport to getting to the boarding gate. Fab airport – no long walks and no queues! Even better, to my total surprise, a person I use to line manage was our Senior Cabin Crew Officer so he gave us free snacks and drinks all flight and it was great to see him again. I also recommend ordering airport assistance for large airports like Charles de Gaulle. Likewise, I also went in a wheelchair around the first chateau we went to at Villandry. This meant I didn’t have to wear myself out before the cycle adventure even started. I got the best bike ever! It had handle bars that swooped ‘backwards’ towards the saddle meaning I didn’t have to lean forward. I think they are called Dutch handle-bars. The leaning forward was the cause of my pain. This was brilliant news and it worked. I hardly got any back pain. I’m getting these handle bars now for my bike in Sheffield. 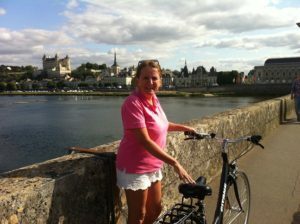 There were two different Loire Valley Cycling packages, one along the riverbank and one to see the chateaux. I chose the latter – not realising that each chateau would be on the top of a great big hill! Now that was a challenge! The first day of cycling was only 18km but all of the others were between 28 and 49km. I have never cycled so far on one day – never mind on consecutive days. We had one day rest in the middle. I can’t recommend Inn Travel, the tour operator, highly enough. The directions were exceedingly clear, and all the hotels were great. Everything went smoothly. They also gave us a 15% discount for being part of Challenge Cancer Through Adventure. I have never done a challenge before and I enjoyed every minute of it – even the hills! All the routes were lovely and meandering and mainly on separate cycle paths or on old, lesser used roads. The routes were not generally the most direct ones, but they were the quietest and prettiest. Day 2: Rigny Usse to Fontevraud. 34km with an ascent of 210 metres. Day 3: Fontevraud to Saumur return. 34km with an ascent of 410 metres. Day 4: Rest day – although we did loads of walking! Day 5: Fontevraud to Chinon 49km with an ascent of 380 metres. We also hired a rowing boat at one of the Chateaux which was on a small river. Parts of the river had a very fast current and when, at the end of the hire period, my husband got out of the boat, he didn’t hold on to the rope attached to the boat. The current quickly took hold of the boat and I went zooming down the river without him. I’d never rowed before and, because of my back, couldn’t even lift the oars. He ended up having to get into another boat and come and rescue me – much to my humiliation and to the amusement of on-lookers!! Thank-you! I can’t recommend Challenge Cancer Through Adventure highly enough. I had a great time. AND I DID IT! !